This product carries a drop ship charge of $21.00. 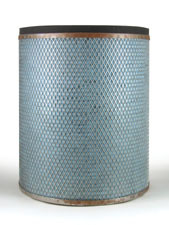 Product Description: The HealthMate Jr. Filter addresses the complete spectrum of air cleaning, removing sub-micron particles, noxious gases and chemicals. Austin Air's 360-degree intake system draws air into all sides of the HealthMate Jr., passing it through this 4-stage filter. The result, more clean air delivered faster and more efficiently than any other air cleaner on the market. Cleaning Area: Every minute, over 125 cubic feet of air passes through 6.5 pounds of Activated Carbon and over 30 square feet of True Medical Grade HEPA. Filter Media: The Austin HealthMate Jr. Filter is a 4 stage filtration system. Stage 3 is 6.5 pounds of Activated Coconut Shell Carbon and Zeolite blend to remove chemicals, gases and odors (e.g. sulfuric acid and ammonia). Stage 4 is 30 feet of True Medical Grade HEPA to remove harmful micro-organisms (e.g. bacteria and viruses). Warranty: Austin has a 5-year prorate filter program. If the filter needs to replaced within 5-years Austin will prorate the cost of a new filter. This pro-rate filter program is available only through Austin. Return Policy: In the event the filter isn't working out for you, you may return it within 2 weeks of purchase. You must contact our Customer Service Department for a return authorization number. Complete the return form that was sent with your invoice. Be sure to include any materials you received, such as the instruction booklet, as well as any parts that may have come with the filter. All filters must be put in a separate box so that there are no shipping labels or writing on the original packaging. We suggest you insure the package and all return shipping charges are your responsibility. Upon its return, the filter will be inspected, and if it is in resellable condition we will credit you back less a 10% restocking fee. In the event the filter is damaged or defective, please save all packing material and contact our Customer Service Department immediately for further instructions.